So what if I were to tell you about a relaxation technique that only takes an hour to 90 minutes. A relaxation state that is so deep it helps the body recover from stress, relieve pain, stimulate blood flow and release endorphins. Some would even go as far to say that it can feel as rejuvenating and refreshing as six hours of sleep. Kind of sounds too good to be true, right? Well let me introduce you to the wonderful/terrifying world of floating. Floating is a type of sensory deprivation where you float in about ten inches of water in a solution of 1,000 pounds of magnesium sulfate (Epsom Salts). Your body is fully supported and it takes absolutely no physical energy to maintain your float. The temperature of the water is warm (not hot) and the room/pod/tank is dark. The idea is to remove all sound, light and pressure from your body allowing for absolute relaxation. Most places offer different options including rooms, pods and tanks – this way you can choose what makes you feel most comfortable. 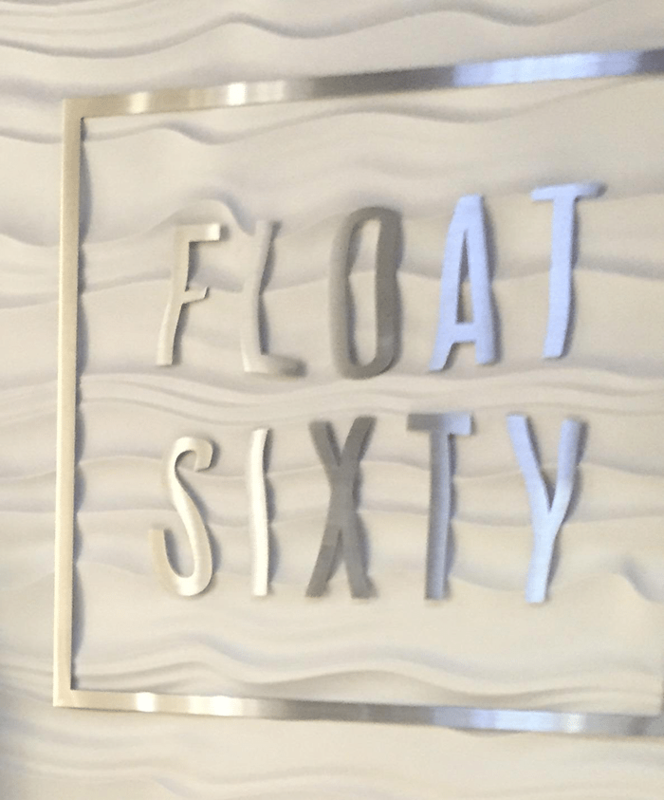 Given all of these great benefits, a Gilt City special and a particularly stressful week, my friend and I decided to check out Chicago’s local float joint Float Sixty. I mean if Johnathan Toews, Matt Forte and Jeremy Roenick were doing it, it was definitely worth a try. When we got there, we were greeted warmly and given a tour of the space, including the float rooms. Given my anxiety of being locked in a pod, I opted for the room. We were instructed to shower before and then step in, lean back and float. Sounds easy enough right? Minutes 1-5: I spent the first five minutes wondering if I was doing it right. The lady who worked there had mentioned there was an orb that would go off when I was ready to start, but I didn’t notice – maybe I missed it? I also spent some time wondering if I had the right neck position, was I leaning too far back, too far forward, should I be using the neck pillow? Minutes 6-15: Once I found a position that worked and found that it was impossible to sink, I started to notice my breathing. It was slightly erratic. Not heavy enough to seem panicked, but definitely not relaxed and stable. I tried taking deep breaths to slow it down and think serene thoughts. This helped and I eventually calmed down and returned to a normal breathing pattern. Minutes 16 -18: I played with the buoyancy a little bit. Floated back in forth in the room, pushing from side to side (I know, anything but the relaxing nothingness I was supposed to be doing, but feeling no gravity was kind of cool). Minutes 19-35: Relaxation. My mind wandered to nothing and I was fully immersed in the silent/dark/warm floating pod. Minute 36: Wait, is that the el I hear? Minutes 37-60: Complete relaxation. I forgot I was in a tiny dark room, and felt like I was in a deep savasana. I may have fallen asleep, or just teetered the line between consciousness and unconsciousness but when the lights came on telling me my session was over, it felt too soon. After a quick shower, I noticed the immediate benefits of the Epsom salt. My skin was smooth and tense muscles were soothed. To be honest, I didn’t feel the extreme calm state that I had read so much about. I would like to give it another chancing considering now I would know exactly what to expect and not use the first 20 minutes as a discovery phase. Overall, the experience wasn’t as powerful as I hoped, however I wouldn’t rule out doing it again. Have you floated before? What was your experience? The self-diagnosed work-out-a-holic, Rachel Mitz can be found all around Chicago, staying fit when she isn't crunching numbers as a director of corporate finance for a commercial real estate company. Chicago area bred and University of Illinois alum, Rachel works hard and plays hard so her daily workouts are her chance to connect with her mind and body. Rachel keeps it exciting by creating up a lineup of both fun and challenging morning workouts from personal training sessions, to boot camps, to spin classes or runs along the lake front (she just completed her first marathon in October). For fun, you can find Rachel trying new restaurants, traveling, volunteering with her favorite middle schoolers at San Miguel or enjoying a glass of red wine and fro-yo. Hi Rachel – GREAT analysis of what to expect during a first float for sure. I found profound benefits to my sleep the night of my float and the night after… did you find the same impact? I think that is my biggest takeaway. I have been thinking about trying this for awhile!! I was afraid it’d be a waste of time, because I have trouble calming my mind… maybe I’ll go ahead and see what happens. It’s only an hour right?